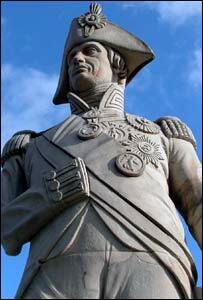 After having his arm X-rayed and being pigeon-proofed, the renovated statue of Lord Nelson has been unveiled. The world famous column in Trafalgar Square has undergone a four-month restoration, its first since 1986. As part of the £420,000 refurbishment, Nelson's left arm, which was struck by lightning in the 1880s, was repaired. Bronze straps on the arm were removed, and previously unavailable Craigleith stone - the material used to make the statue - was used to restore the arm. Since the closure of the Craigleith quarry in Scotland 60 years ago, getting hold of the stone is said to have been virtually impossible. Previous renovators had patched up Nelson using a mixture of mortar and cement. But Craigleith stone was salvaged during a restoration of Donaldson's School for the Deaf in Edinburgh, and was donated to the Nelson's Column restoration by Scottish company Watson Stonecraft. The Grade I listed column was completed in 1843 to commemorate Admiral Horatio Nelson, who died at the Battle of Trafalgar in 1805. It was designed by William Railton and cost £47,500. The top is decorated with bronze acanthus leaves. The square pedestal has four bronze panels, cast from captured French guns, depicting Nelson's four great victories. Mayor of London Ken Livingstone, who commissioned the restoration, said: "Using the original stone has allowed the restorers to take an authentic approach to the conservation of a monument built 163 years ago. "It will ensure that this unique monument can be enjoyed by Londoners and visitors to the capital for many years to come." It has been cleaned several times but the whole monument has only undergone restoration twice previously, in 1968 and in 1986. Adrian Attwood, from David Ball Restoration Limited, which carried out the restoration work, said: "Our philosophy at the start of the project was that we would repair Nelson as carefully as if it were a statue at ground level. "Using the Craigleith stone and repairing Nelson's arm means that we have exceeded our own expectations. We leave Nelson looking much better than he has for many years." He added that an anti-perch system, essentially blunt plastic spikes, had been fitted to the bottom of the column shaft at "pigeon cruising altitude", to stop the birds settling. For the first time a laser survey was carried out to check the dimensions of Nelson's Column which reveals it is shorter than previously thought, standing at just over 169ft (51.5m) when measured from street level to the top of the Nelson statue.